Im looking to do a rear disc swap on my malibu finally. I dont have any f bodys at my local bone yard but there are some blazers/s10's. I plan on buying a new kit for the rear (caliper, pads, rotors, caliper brackets) but i cannot find any 2wd blazers at my local yard they are all 4x4. Does anyone know if the rear 4x4 blazer backing plates are the same as the 2wd backing plates? since im buying everthing new all that i need is the backing plate that mounts to the rear end housing. Just buy the backing plates new from rock auto for under $12 a pop. The axle to caliper brackets are different between 2wd and 4wd. 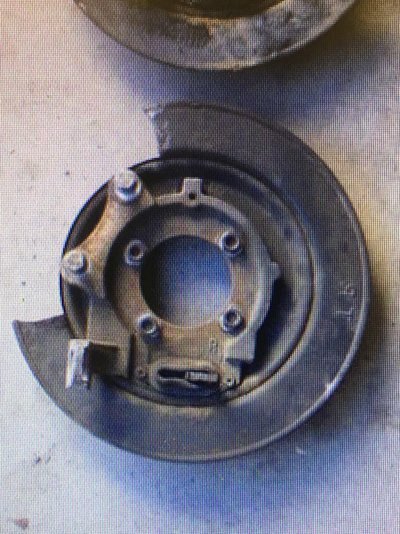 Calipers are the same, rotors on a 4wd have like 1" wider of "hat" where the e brake drum sits. Otherwise its pretty similar. 4wd puts the calipers forward of the axle centerline, 2wd puts the calipers rear of axle centerline. The calipers on a G body forward of axle centerline will hit the frame. A 2wd backing plate can be used on a 4wd axle and vice versa, you just need a tin snips and a few mins, also you have to be OK with another 1 inch of rotor showing or something but since nobody is mud bogging their G body its nothing to worry about. 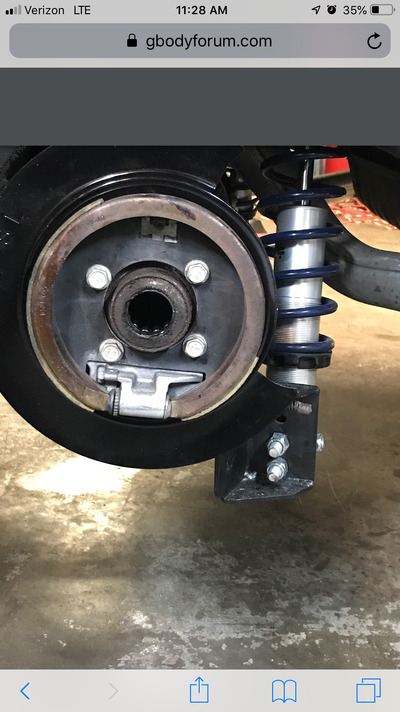 If you are a real tightwad you can buy an entire 7.5 disk brake 4wd setup, flip the brackets so the calipers go on the opposite side from the blazer, buy new rotors, and reuse everything else. You just loose E brake capability unless you build another bracket. Correct me if I’m wrong but don’t the backing plates bolt to the rear end or is that the caliper to axel bracket? I thought that these were the backing plates. Or are backing plates the same thing as the dust shields at well. My main reason for the swap is if I throw an axle I don’t want it to go flyying while I’m in between rear end swaps if I even swap it. I also want it for aesthetics. This is the kit I am looking to order once I get the part I need to mount the caliper mounting bracket to the rear end. I have new moser 28 spline axles and arp wheel studs going in as well. I am not worried about having a functioning ebrake and don’t plan on doing the work for it. Yeah, I the backing plate is the dust shield. The cast iron part is the caliper bracket. Yeah, the only issue you run into like I mentioned is that to use all the 4wd stuff minus rotors you have to flip the sides the brake parts came off so you loose the e-brake cable bracket since it points backwards instead of forwards. Some people that run coil overs have the spring hit the caliper, but if you run normal shocks that shouldnt be a problem. Just an FYI, those dust shield/backing plates rust VERY fast from the factory and the 2 axles I have bought for parts had them entirely rusted out. It's a good opportunity to spend the $25-$40 to buy nice new shiny parts and get a pair of new ones. That seems easy and i dont plan on using the ebrake at all my line is broken and shot its an auto 4l80e also. im not running coilovers just a normal umi sport shock. ive read they are pretty nasty i saw some on the 4wd setup. since the 4x4 axel to caliper bracket will only relocate the position of the of the caliper and the caliper bracket and caliper are the same part number the complete 2wd blazer kit should bolt right up. cheap nice new red powder coated calipers from power stop.